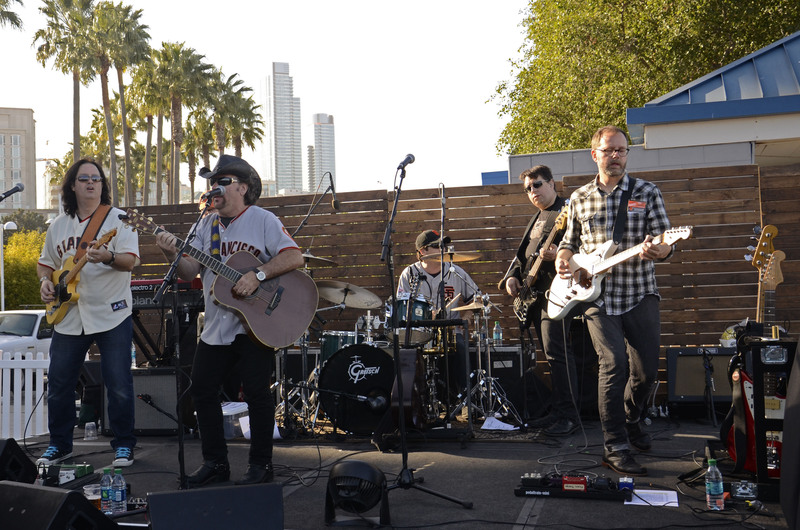 When I made plans to photograph the scene outside AT&T Park before last Friday’s Giants game, I didn’t expect a rock concert to break out. But that’s exactly what happened as Petty Theft, a Tom Petty and The Heartbreakers cover band from Marin County, were rocking out at Seals Plaza, right outside of the park. Petty Theft is a really tight 6-piece band who faithfully covered all of the big hits from the Tom Petty songbook (including my TP faves Kings Highway and You Wreck Me), as well as a few obscurities.The show was first of this season’s Orange Friday Happy Hour of live shows before Friday home games (it’s called Orange Friday because the Giants always wear their orange jerseys on Fridays), and what a great way to end the working week. 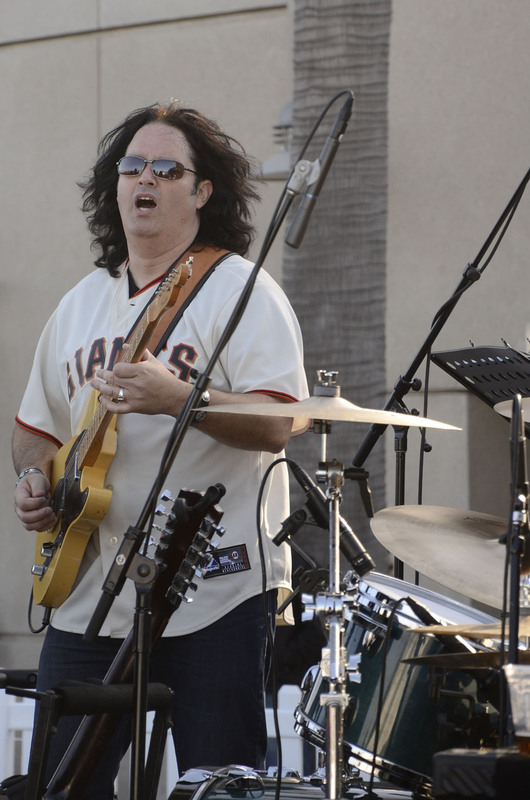 Petty Theft rocked the crowd with a fun, two-hour set before last Friday’s game against the New York Mets that fans really got into, especially one guy who stood at the front of the stage playing a mean air guitar. Cover bands can be funny, because sometimes the band (or at least the lead singer) eventually come to believe they really are the bands they’re covering, and they can go a little too far in emulating their heroes, often crossing that fine line between homage and parody. When I was a college student in Philly we used to check out a Bruce Springsteen cover band called Badlands that played the club circuit at the Jersey shore, and the singer actually thought he was Springsteen, wearing the same get-up Springsteen wore on the cover of Born To Run and telling rambling stories in between songs that were nowhere near as interesting the as the real Boss (sorry, dude … the frustration of waiting for the cable guy doesn’t make for a compelling yarn, even if you’re faux Springsteen). I once saw the singer of a Rod Stewart cover band kick soccer balls into the audience like Stewart used to do in his live shows, and you might remember my recent post from the San Francisco St. Patrick’s Day Parade where the singer of the U2 cover band Zoo Station aped all of Bono’s moves to a T, including a holier-than-thou-watch-me-walk-on-water-when-I’m-not-having-brunch-with-Bishop-Desmond-Tutu attitude. Identity problems, anyone? To their credit, Petty Theft just came out and rocked, or, as their websites states, “Petty Theft is not an average cover band. They are the ultimate tribute to one of America’s most endearing rock ‘n’ roll legends: Tom Petty. It’s not about costumes and get-ups, it’s all about the music.” So none of the band members wore a Tom Pettyesque top hat and the singer didn’t deliver the songs in a nasal drawl in an effort to sound like Petty. Nope, it was pretty much straight ahead rock ‘n’ roll … just the way we like it! In fact, Petty Theft was so much fun, and they rocked so well, I definitely want to see them again. Kick in the fact that the Giants scored an amazing come-from-behind 4-2 win, and it all made for one very excellent Friday evening at the ball park! Check out more unexpected stuff at Ailsa’s Travel Theme! This entry was posted in Ailsa’s Travel Theme, Photography, San Francisco, Stephen Kelly Photography, Travel Theme and tagged Ailsa's Travel Theme, Concert, music, Photography, San Francisco, San Francisco Giants, Stephen Kelly Photography, Travel Theme, Where's My Backpack. Bookmark the permalink. Hi Jo … then you’ll be even happier next month when Tom Petty releases a new album. Then he’s going on tour … with Steve Winwood (at least here in the States). Hi Patti … it was as much fun as you can have at a Tom Petty concert … without Tom Petty actually being there! This is cool, Stephen. 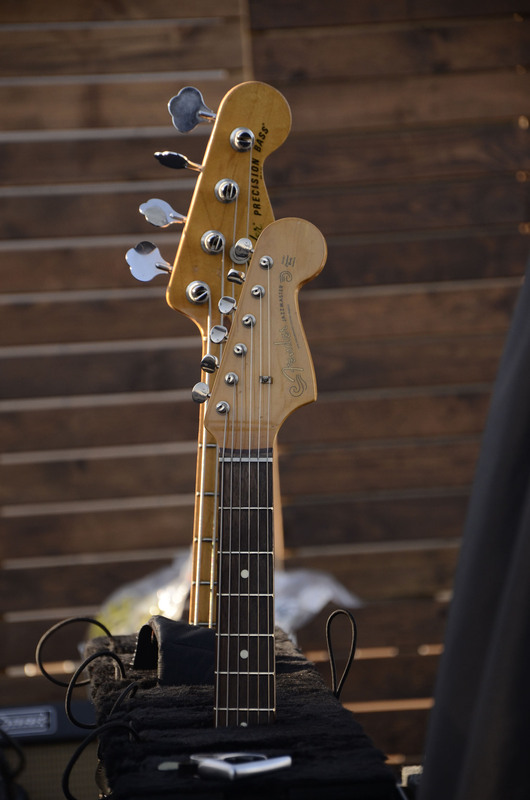 The close-up of Michael Papenburg’s guitar is my favourite in the gallery. Hi Paula … thanks! That’s my fave too!